Educators, students, parents and friends stage protest to push Sacramento lawmakers to preserve funding for public schools. 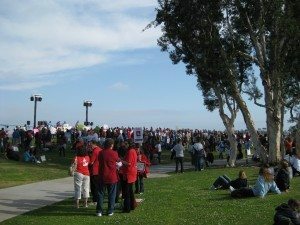 North Embarcadero Park was the site of a large and enthusiastic rally that saw several thousand participants voice their support for public education and the teachers who provide it yesterday. The teachers and their proponents gathered to protest the massive funding cuts to California’s public school systems, and to send a message to state legislators that further decimating education to provide tax breaks for corporations and the wealthy is the wrong solution to the California state budget crisis. 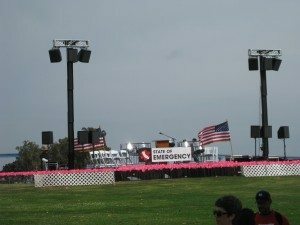 The stage at the front of the rally was adorned with 4,108 pink slips, each one representing a layoff notice given to a teacher in school districts from San Bernardino County to Orange County, down to San Diego and Imperial Counties. Students, teachers, parents, classified school employees, and friends joined San Diego 9th District PTA president Karen Fleck, chanting in unison “Cuts hurt kids,” a theme that was repeated throughout the evening. “We need our representatives in Sacramento to understand that we must invest in our children today to ensure a brighter future for all of us,” Fleck said. “We’ve been told we must meet tougher and tougher academic standards with significantly less support. We’ve been mandated and directed so many times on so many fronts by people with no expertise and no business issuing mandates,” Obermeyer said. The San Diego Unified School District budget will be cut by an estimated $114 million for the 2011-2012 academic year in addition to the $400 million that has already been cut from the district budget over the last three years. 750 teachers have already been given notice that they may be laid off. San Diego schools have seen strong improvement in state test scores in year-over-year testing despite the drastic cuts. 34 of 39 high schools in the SDUSD saw higher scores over the previous year, as did 27 out of 32 middle schools and 90 of 130 elementary schools. Still, San Diego schools face the prospect of sliding backward with fewer teachers and scarce resources in the classrooms. “We cannot afford for our kids to be warehoused in overcrowded classrooms” and left to fall behind, said Bill Freeman, President of the San Diego Education Association. Current student to teacher ratios in most K-3 classrooms throughout San Diego are at 24:1. Current projections have class sizes rising to 30:1 due to the current budget shortfalls. A ratio of 20:1 is considered ideal in order to ensure that each student gets enough individual attention from their teacher to assure their advancement; a level that was seen as recently as two years ago. “There are people who will tell you that we can balance a budget without revenue, but we know that’s not true. Not without affecting the very most vulnerable in our society,” Lorena Gonzalez, CEO of the San Diego and Imperial Counties Labor Council told the crowd. Republican legislators in Sacramento and throughout the United States have taken the position of the TEA Party that taxes already too high and thus must be cut further. School advocates are pushing for California Governor Jerry Brown to extend the temporary state tax hikes enacted in 2009 to help alleviate the budget crunch and save the state’s schools from further cuts. The budget proposed by Democratic lawmakers calls for a 5 year extension of the temporary 1% sales tax increase, .5% vehicle license fee increase, and .25% state income tax increase that were set to expire this year. Conservatives insist that there’s no need to raise revenues to pay for vital services such as education, police, and fire protection. Republican lawmakers have countered with a budget proposal that includes no tax increases (and allows the temporary hikes to expire), the shifting of funds for state mental health care programs and child programs and programs for the disabled into the general fund. Still, schools are not expected to see any relief. The 2,000 strong at the teacher’s rally was countered by a small contingent of TEA Party protestors brought out by Americans for Prosperity, the Koch Industries backed conservative group behind the TEA Party movement. AFP protestors showed up in a white limousine decrying state worker greed. 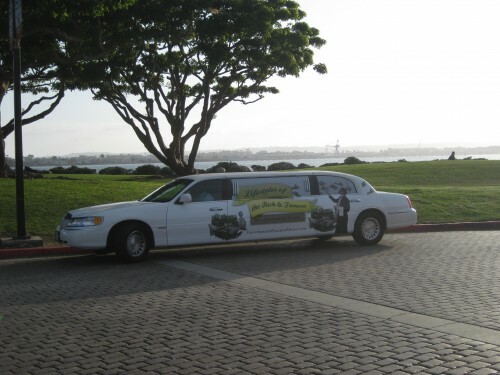 “Lifestyles of the Rich & Famous on a Government Pension” read the banner emblazoned on the side of the limo. Oddly, none of the teachers or union members arrived at the rally in a limousine. But it was the “Cuts hurt kids” rally cry that carried the day at this “State of Emergency” assembly. Nice job Andy. There were lots of folks there and I was happy to see that. There was some disappointment in the location by some people because it wasn’t more in the public view. We took the trolley and when we got off at SeaPort Village everyone on our car got off and headed to the rally, then we filled the trolley up heading out. Gregg Robinson was the best speaker, not that we’re biased or anything… :D but he was at his passionate best! Andy, your post totally trumps this morning’s front page article in the San Diego U-T about the rally, thanks for your diligence. As most of the teachers were having their glass of wine after the rally (a joke at the rally), you must have been listening to your recorder and figuring out your scribbled notes. I was surprised to see such prominence given to the teachers, as nothing was said by the U-T of the Feb 26 union rally in front of the County Admin Building. Perhaps they received so much flack that they had to follow-up with today’s display of attention. The audio is available if we can figure out how to embed it. It actually didn’t turn out too badly–not great, mind you, but at least it’s audible. So, you didn’t go to the “reform” group event this morning? Had to go meet the newborn niece.